UnRated Chicago Chicago Magazine is an entertainment publication covering live music, celebrity appearances, entertainment in the Loop, Chicago and surrounding suburbs. We cover the Windy City. UnRated Our photo archive is vast containing Hollywood film actors, music entertainers, sport athletes, celebrities, book signings, and many other event appearances close to 20 years. The flagship magazine, UnRated Magazine, was founded in 2001. Colorado progressive apocalyptic metal duo COBALT will kick off their long-anticipated North American headlining tour today. The trek will commence in Seattle, Washington and run through September 24th in Denver, Colorado. The pair -- multi-instrumentalist/mastermind Erik Wunder and new vocalist Charlie Fell (ex-Lord Mantis) -- will be touring in support of their Slow Forever full-length, released this past March on CD, LP, and digitally via Profound Lore Records. Pitchfork named the record the band's, "best-ever," and, "as accessible as it is aggressive, with magnetic hooks, shout-along mantras, and sparkling riffs. 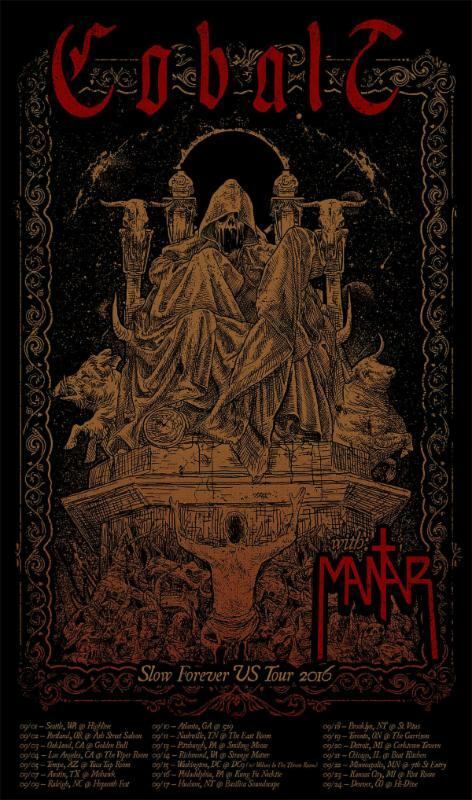 The Slow Forever Tour 2016 features support from Germany-based infernal metal twosome MANTAR who are touring in support of their Ode To The Flame full-length released this past Spring via Nuclear Blast. 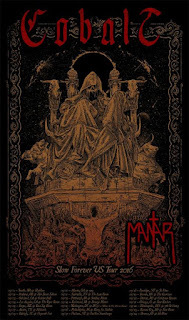 "MANTAR have a thing for destroying stuff by fire... ," said Decibel Magazine, "2014's Death By Burning roasted away all the unnecessary to create a raw, straight-forward stomp of blackened doom punk that made for existential inquiry to the tune of a punchy beat. Sophomore Ode To The Flame spreads that inferno, scorching through forty-plus minutes of atmosphere-drenched vitriol." In celebration of what will easily be listed among the year's most crushing events, long-running metal portal Metal Assault, in association with EarsplitPR, Hexagram Booking, Profound Lore, and Nuclear Blast, will be giving away one pair of tickets for each night of the tour (excluding festival appearances and the Wolves In The Throne Room date). To enter, simply follow the instructions at THIS LOCATION. Deadline for entry for each show is 3:00pm EST the day prior to each performance. Winners will be notified the evening before the show date. Good luck! UnRated Magazine. Powered by Blogger. Check out the United Buying And Finance Service price before you buy or you may be paying too much for a new Car! Are You Buying or Refinancing Your Home? Let us get you a low rate, our counselors are here for you. © 2011-2018 UnRated Magazine, All Rights Reserved.